My wife and I paid a return visit on Sunday 10th July after a country walk. At the bar, a man recommended the Trooper ale, so I chose that and it was indeed very good, although mid-pint I swapped it with my wife's pint of Conqueror's (which she wasn't keen on, but I liked just as much as the Trooper). For my second pint I switched to something called East Street, which was fine but not as nice as either the Trooper or Conqueror's. The very friendly man we had spoken to earlier came by again a little later on and it turned out he was one of the managers at the pub but on this occasion was on his night off. All in all, this is a decent Wetherspoons and very convenient for the railway and bus stations, so we'll no doubt be back again the next time we go walking in the Potters Bar area. I have been coming in here since it opened. Fairly average Spoons Pub, food is "OK" and they have a good selection of guest Ales. It is not very "cosy" as its built in retail space that used to be the local Tesco. I don't know if being close to the Rail Station and Bus route is the cause but this Pub is full of older people and those that have the sort of "Job" that allows then to get well oiled in the afternoon. Great for a cheap bit to eat but I would not take the family there as there are better options in walking distance. Nice pub but lazy bar staff just come straight out of kinder garden.They must have a competition who can get away with serving the biggest head on a pint.Very good at over charging you as well. 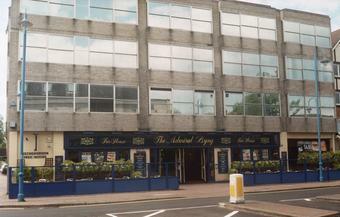 This Wetherspoon's is located on the ground floor of what appears to be a 1970s office building on the high street at Potters Bar. The space is wide but not very deep, so you can never be that far away from the front door, which seems to prevent it from ever feeling particularly cosy, wherever you choose to sit. Despite that, I found the service to be very friendly and polite. My visit was during a Wetherspoon's real ale festival so there were plenty of interesting beers to choose from -- I opted for the Caledonian Coffee Porter and it was very good.